U.S. Secretary of State Mike Pompeo chats with Chinese Foreign Minister Wang Yi before their meeting at the Great Hall of the People in Beijing, China, June 14, 2018. China's Foreign Minister Wang Yi has urged the United States to make a "wise decision" on trade as a deadline for the administration of President Donald Trump to release a list of tariffs targeting $50 billion in Chinese goods approaches. Speaking at news briefing Thursday, flanked by U.S. Secretary of State Mike Pompeo, the Chinese government's top diplomat said China and the United States were at a crucial phase, a point where opportunities and challenges were rising. One of the big challenges Wang mentioned was trade. On that subject, he urged the United States to not take any unilateral steps that would create obstacles for future negotiations. Wang said that for trade, there were two choices. "The first choice is cooperation and mutual benefit. The other choice is confrontation and mutual loss. 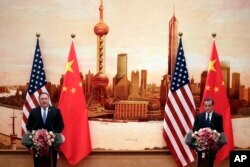 China chooses the first," Wang said. "We hope the U.S. side can also make the same wise choice. Of course, we have also made preparations to respond to the second kind of choice." An administration official told Reuters on Thursday that Trump had made up his mind to impose "pretty significant" tariffs on Chinese goods. The White House had said late last month that it would be pressing ahead with measures aimed at "confronting China's unfair trade policies." Trump is due to unveil revisions to his initial tariff list Friday. The list will contain 800 product categories, down from 1,300 previously, Reuters reported, citing another administration official and an industry source familiar with the list. Trump no longer believes that Beijing's influence over North Korea is a compelling reason to ease up on trade talks, now that his administration has opened up a direct line of communication with the nuclear-armed country, the first administration official said. U.S. Treasury Secretary Steven Mnuchin argued against imposing the tariffs at a White House meeting on Thursday, but he was not expected to prevail, the official told Reuters. Even if the tariffs list is announced, the president could delay their implementation for 30 days, and even longer if negotiations are going well. If they are implemented, China has promised a tough response. 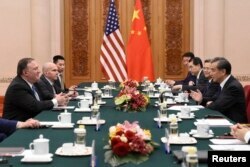 Chinese Foreign Minister Wang Yi, right, meets with U.S. Secretary of State Mike Pompeo, left, at the Great Hall of the People in Beijing on June 14, 2018. The two sides have made some progress toward addressing the two countries' massive trade imbalance, with China putting forward a proposal earlier this month to purchase $70 billion in farm, manufacturing and energy products. China has also said it will cut import tariffs on automobiles and consumer goods. Those proposals, however, are contingent on the administration's not carrying out its trade tariff threats. If the United States does proceed, China has said that it will respond by placing its own duties on American goods, including soybeans, cars, planes and other products. In his remarks, Pompeo did not address the looming deadline, but he did stress the U.S. deficit with China was still too high. "I stressed how important it is for President Trump to rectify that situation so that trade becomes more balanced, more reciprocal and more fair, with the opportunity to have American workers be treated fairly," Pompeo said. FILE - U.S. Secretary of State Mike Pompeo, left, speaks during a joint press conference with Chinese Foreign Minister Wang Yi at the Great Hall of the People in Beijing, June 14, 2018. He added that during his first visit to China, he had good and constructive discussions, but he also noted that when the two countries disagreed, they would continue to speak up for their values and interests, including on issues such as human rights and rule of law. The secretary's visit to Beijing came days after Trump and North Korea's Kim Jong Un held their summit in Singapore. Pompeo's trip was largely focused on briefing China's leaders on the Trump-Kim meeting and discussing the path forward. "We really appreciate all that China did to help put us in a place where that summit could happen, and we thank you for that," he said. "There is still more work to be done by China and the United States to get to the ultimate outcome." One key challenge the two face regarding North Korea is pushing forward denuclearization on the peninsula and the question of when sanctions should be loosened. China is North Korea's biggest trading partner. Trump has praised Beijing's support of the international community's toughest round of sanctions on North Korea to date, but he also noted at his post-summit news conference in Singapore that China clearly had already begun to loosen its grip a bit. Pompeo said that during his meeting with the Chinese foreign minister, China reaffirmed its commitment to honoring the U.N. Security Council resolutions on the sanctions. The secretary said that while the resolutions have room for relief in them, the two agreed that such measures would be considered at the appropriate time. "We have made it very clear that the sanctions and the economic relief that North Korea will receive will only happen after the full denuclearization, the complete denuclearization, of North Korea," Pompeo said. With Trump-Kim Summit Over, What Now?